Some amazing friends that push me to go faster and longer than I sometimes feel like going. They always show up and are ready to work hard and make me laugh. Running keeps me balanced and provides some rhythm and ritual to my sometimes hectic life. It does not require a lot of expensive equipment and can go with me anywhere. It is time well spent on my mind and body. Sometimes it is the time I need for solitude for myself. On the other hand it is often my social time to participate in a shared experience with friends. I would say it was about mile 4 in the of the Boston Marathon in 2014. It was the year after the bombing and the energy around this race was very intense. The support of the crowd and love that was pouring out of that city was unlike anything I had ever experienced nor will I experience it again. Everyone was sharing stories that were raw and brave and about so much more than running. It was an astounding experience and at about mile 4 I felt every an overwhelming wave of emotions. Which is hard to do while running! Everyone was out there running as one. I have had successful marathons because of pacing myself well. It is key to not hitting that wall and being able to push through all the way till the end. Because I feel confident in this particular area of running, I hope to help others with meeting goal times with steady pacing. Marathons are so communal and we may only spend a few hours together but they are such important hours you may never forget this group you got to be with. 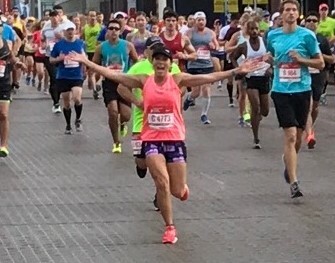 My best pacing experience came from trusting a 3:15 pacer in the Chicago Marathon. That allowed me to really focus on my stride and relaxing into the race. I was able to not obsess about my pace and stick with someone so I could eventually PR. I hope to do the same for others. Also in my first marathon, I was 21 years old, I was very conservative since I was not sure what I was getting myself into. It payed of and felt good at mile 20 and started to push it harder. Not a single person passed me in the last 6 miles and I felt super strong all the way to the mile 26.2. I hope to have people in my group that are ready to stick to a plan so they will meet their goals. After you have trained properly and put in so much dedication, hard work, and effort it is time to lay it out there on race day and have some fun at the same time! I will be your number one fan while you run with me and truly do all I can to support you in whatever ways you need. I might have a few stories to share with you as entertainment along the way! Do your best to know your correct pace. Set a challenging, yet attainable goal. Know your body and do your best to prevent bonking. Your goal marathon pace corresponds to your aerobic threshold. If you go too fast you will burn through your storage of carbohydrates more quickly. Therefore simply going 15 seconds faster than goal pace for 4-5 miles could cause you to bonk at the end and consequently you will not fish as fast as if you just held to your pace. Also, I feel it is important to have a range of goals graded in difficulty. This is a good way to make sure you reach at least one of your goals and do not feel like you have failed if things do not go perfectly. I’m a mother of two kids and love being a “mother runner.” I ran thousands of miles pushing my kids and now they bike along with me. My dog is often at my side running in stride with me too. I am an artist which takes a lot of showing up and putting in the hard work, just like training for a marathon does. Yes both things do involve a certain level of natural talent, but it is a lot of years of training to succeed in both.